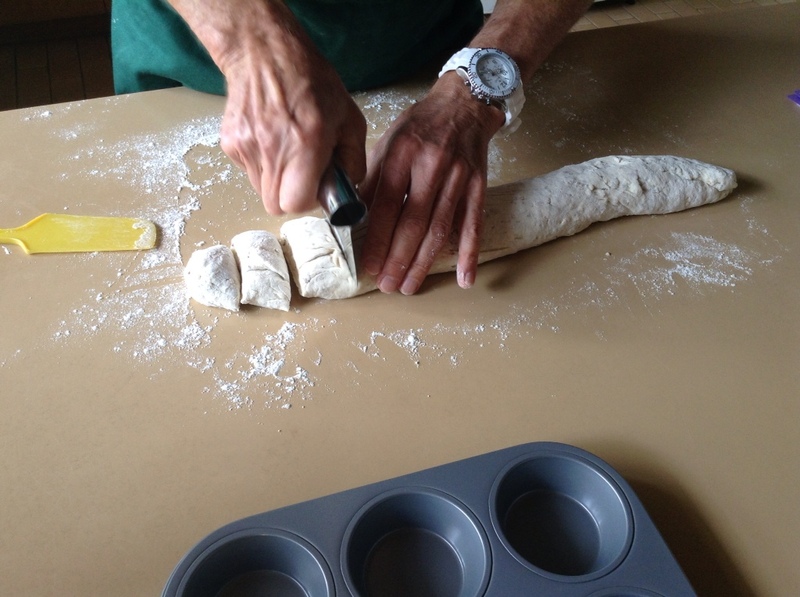 The Artisan Bread in Five Minutes a Day website describes a method of making bread without kneading. There is also an accompanying book. The method described uses yeast and the recipes use US measures. Converting these recipes to grams and sourdough takes a bit of experimentation, but it can be done. The great thing about this method is that aside from mixing the ingredients, the dough requires very little attention until you are ready to bake. That makes it suitable for people who work or are away from home most of the day. 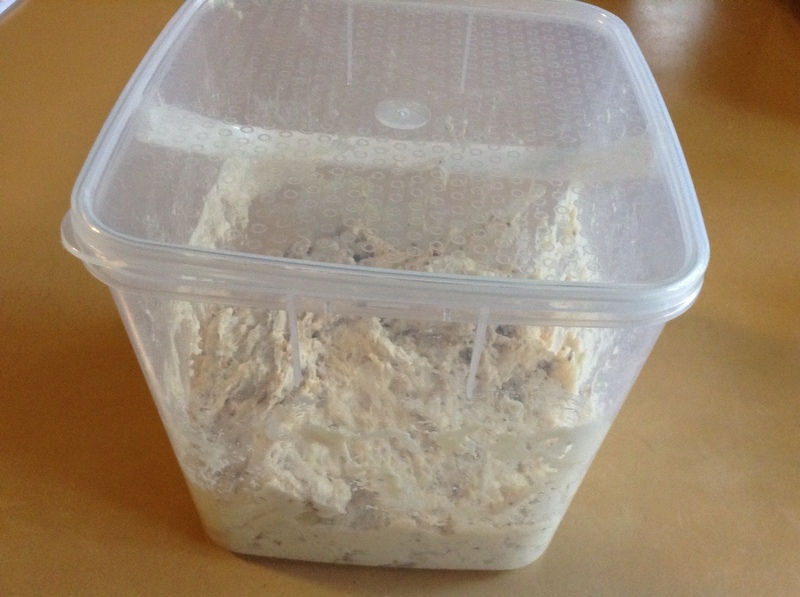 All you require is a food-grade bucket with lid about 5 or 6 litres capacity, cheap home brand flour and sourdough starter. The evening before you want to bake, mix the ingredients in the bucket, put the lid on and leave it to rise overnight. Next morning put the bucket in the refrigerator, and the following evening (or up to 2 weeks later) bake. Easy! You don’t even have to use all the dough at once. You could take a small amount out each night and bake fresh rolls for dinner or (my favourite) bake a batch of bread muffins and keep them in the freezer, taking some out whenever you want some bread rolls. Allow the dough to rise overnight in a warm spot. Next morning, place the bucket in the refrigerator. The dough is easier to handle when it is cold. 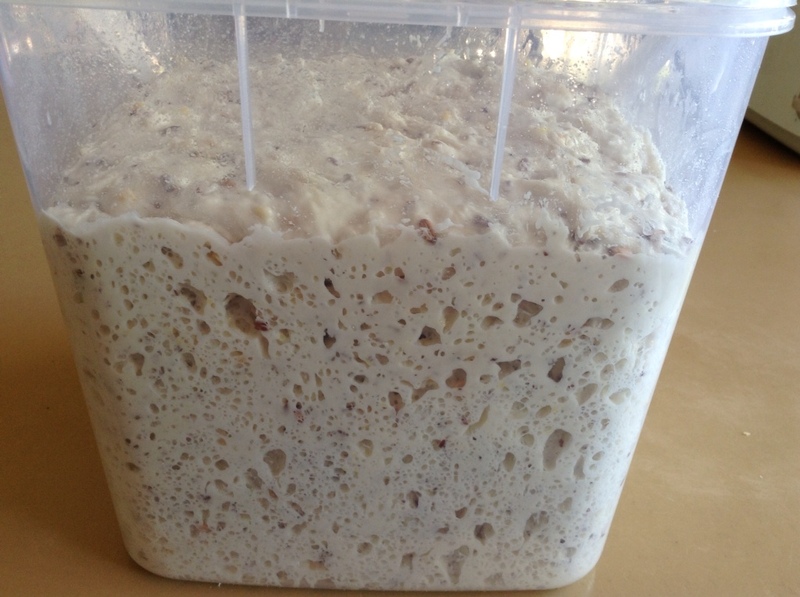 The dough should be used within two weeks. The following morning remove the bucket of dough from the refrigerator and place the required amount on to a well-floured bench. Put the remaining dough back in the refrigerator. 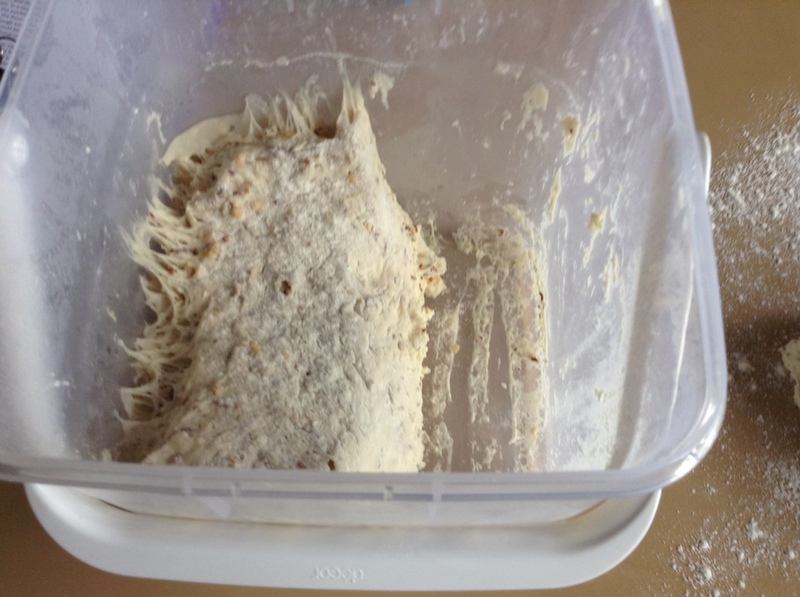 After a night in the refrigerator, half the dough has been removed. Gently roll the dough into a thin sausage and cut off amounts to place in a muffin tray. The pieces should be a little more than half the size of each muffin cup. 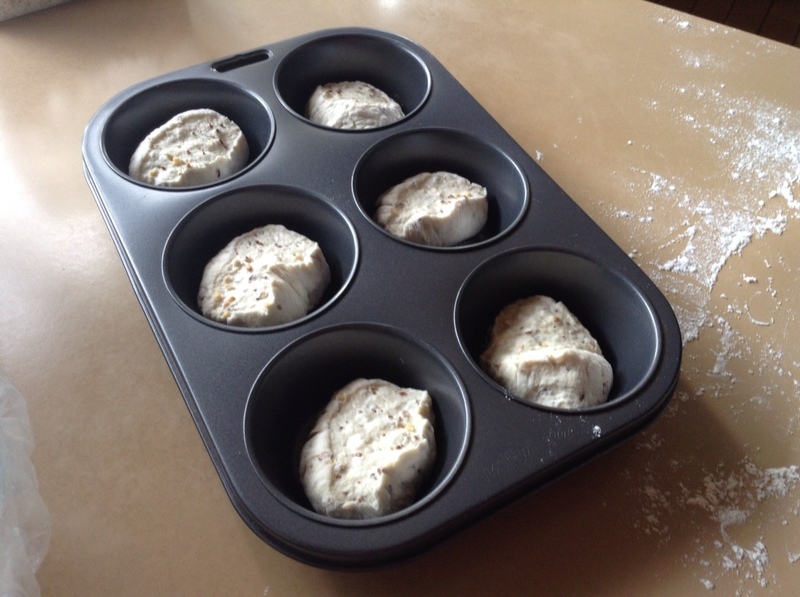 Place the muffin tray in a warm place to allow the dough to rise to fill the cups or about double in size. When ready, pre-heat the oven to about 230°C and place a baking tray in the bottom of the oven. When ready place the muffin tray in the oven and add a cup of hot water to the baking tray. Bake for about 20 minutes. 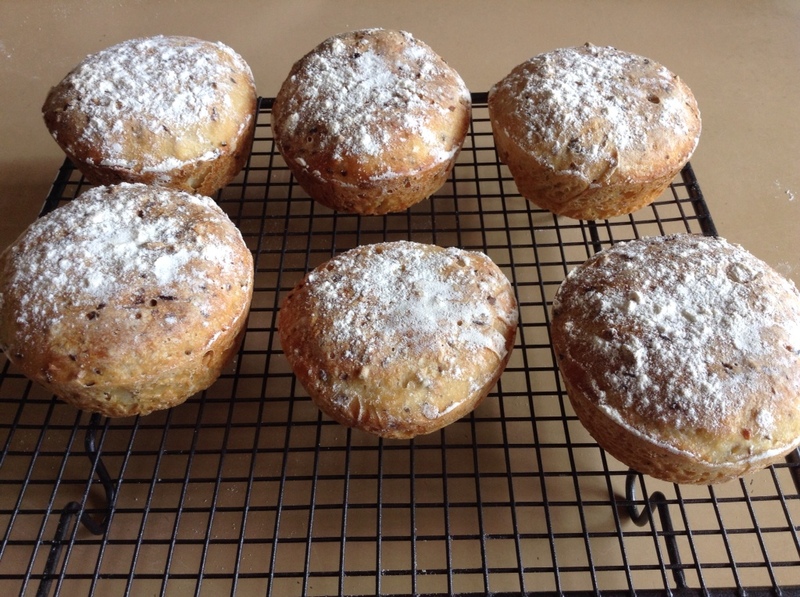 Bread muffins on a cooling tray. Sourdough no-knead recipe can be downloaded by clicking the button below.